"I'm pretty happy today because finally, finally, I can show you Dead Rising 2." — Keiji Inafune, head of research and development at Capcom. The original Dead Rising may have been a technological breakthrough, a wonder of body count and open-world exploration, but what really sold it for me, and for many, was the game's heart. It had personality, most of it packed into gruff photojournalist lead Frank West. So when the curtain was raised on Dead Rising 2 last week, I was hoping for a glimpse at the game's soul. What we got instead was a detailed run through of its engine. Dead Rising 2 wasn't built on the shambling corpse of Dead Rising. Instead, Canadian developers Blue Castle started from scratch creating a new engine written specifically for the new game. "What we are showing you today is something completely new," said Dan Brady, CEO of Blue Castle Games. "It is not based on the engine used in Dead Rising one, this is a completely unique and original engine written specifically for Dead Rising 2." Brady said that making a sequel for Dead Rising had some interesting challenges, most of them fueled by gamer expectations. They knew that people would expect that any sequel would not only deliver the ability to use any and everything as a weapon and fill the screen with zombies, but that it would have to one-up the original title. Brady opened the demo with a view of the center of Fortune City, a typical small town casino. The game's new lead, Chuck Greene, stands in a yellow motocross racing jacket under a giant Fortune City sign that stretches across a wide road. The road is teeming with zombies. The zombies mill about, hundreds of them. There are, Brady says, currently 1,000 zombies on the screen, or double what you could have in the original game. He picks up a bat and Greene home-run swings into a small clutch of the undead. The fidelity of the zombies are also significantly higher than in the original, he says as he picks up a guitar from the ground and starts slaying. In the original Dead Rising, he says, the idea of density was explored. You could also go in a place and have access to anything and everything, it was really a hallmark of the game. Brady picks up a chair, throws it at a zombie, and then, now inside one of the casinos, dislodges a roulette wheel from a table and slaps it into a couple of enemies. The thing is, he says, the access to everything in the original game was sort of an illusion, because you couldn't really use everything on screen as a weapon. In Dead Rising 2 they have an "awful lot more props and an awful lot more physics." The items, at least during the demo, are all marked with a little icon, so you know you can go and pick them up by pressing the B button. As he talks, we see Greene use furniture, a cash register, bats, a dice stick and even a moose head as a weapon. "Being that we are a Canadian developer we had to include a moose head," Brady says. Greene plops the head on his head and then charges through the crowd of undead killing them. He stops and swings his head back and forth sending zombies flying with the antlers. "As a western consumer, I like guns a little more than Capcom likes guns," Brady said. "Capcom has a history of maybe not spending as much time as they should with guns." Brady has Greene pluck a machine gun from the ground and starts emptying it into the wall of seething zombies. Blood sprays everywhere. While holding the gun there is a large targeting reticule on the screen and Greene can strafe as he fires. "Guns are not the prime weapons of Dead Rising 2," Brady says. "It's a sandbox game about playing the game your way. If you are a gun fan, we have some big surprises for you." Brady moves Greene over to a propane tank sitting on the ground, it is wrapped in nails. The character swings it around killing zombies with it. He throws the tank into the crowd and shoots it, there's a startling explosion and a wave of light roils out, embedding and killing zombies with the nails. As Brady works his way through the demo and the crowd of zombies I notice the kill number rolling up in the bottom right corner of the screen. The top right corner shows the weapons. Greene's level is displayed and, to my surprise, so is a number for how much cash Greene has. Brady works Greene over to a samurai sword lying on the ground. Dead Rising 2 will introduce procedural cutting o the game, he says as he slices a zombies arm off, and then turns and neatly cuts another in half, vertically. Another he chops horizontally, a fourth he cuts half of their head off. The zombies, I notice, seem to disappear within seconds of hitting the ground. I count, it's about five seconds. Despite the zombies that fade and vanish before your eyes, the screen is still littered with bodies. I'm not sure if this is a trick of the demo, or a permanent plan for how death in a zombie filled casino town will be handled. "What you are looking at right now is roughly 2,000 zombies, four times than what was in Dead Rising One," he says. One of the most popular weapons in the original Dead Rising, it turns out, was the simple bucket. Blue Castle decided to improve on the bucket's design in Dead Rising 2. Now it features a bunch of drills and when slapped onto a zombie's head, they go to work. Brady demonstrates. The bucket snaps over the zombie's head, the drills kick in, loudly, blood begins to shoot from under the lid, eventually the zombie falls to its knees and then topples on its side. "Zombies are about a force, a pressure, almost a raging river," Brady says, They are not, he points out, about taking down individual enemies. What better way to deal with a raging river than with a paddle saw? Greene picks up a paddle with a chainsaw duct taped to either end of it. He starts the saws and then starts cutting his way through the living river. The kill count is now at 202. "Our guy is wearing a bike jacket," Brady says. "Chuck Greene is a motorcross guy. We plan on making vehicles a much bigger part in this game." Greene hops onto a dirt bike and guns it into the crowd of zombies, working his way up the crowded street. When he hits zombies they fly into the air. It's an amazing spectacle to witness: A man on a dirt bike parting a sea of zombies. At the end of the street, Greene does some impressive donuts, sending more zombies into the air, and then turns and comes back down the street. The kill count is now 410. "The user is going to have fun playing in this sandbox world," Brady says. Next he shows off a dirt bike with chainsaws duct-taped to its handlebars. Hopping on, Greene tears through the crowd, cutting zombies in half as he goes. Blood splatters on the screen. There are now 7,000 zombies on the screen, the game and its new engine's max. Greene drives through them at full speed, bodies and body parts fly everywhere, it's just absurd, a solid wall of zombies. He cuts through them as if they were grass. When he hits the clearing, the kill count is now at 1,646, and he's at level 22. "This game is about more zombies that it has ever been before," Brady says. 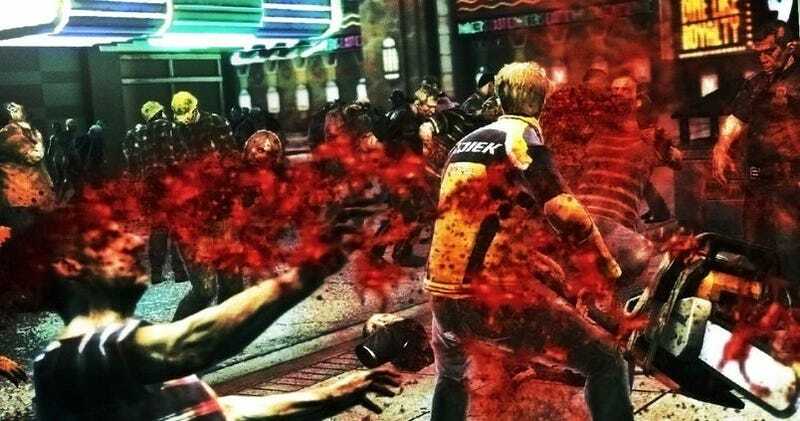 Inafune says that the original idea for Dead Rising 2 was to make maybe two or three times more zombies than in the original game. "Capcom has pretty good technology, I didn't think they would be able to make any more than that number, " he says. "And you saw the end result here." He said that Capcom was also worried that Blue Castle would have to lower quality to hit the high numbers, but says that they actually managed to raise the quality for each mode. "It's not just about if you make a lot more zombies it will be instantly fun," Inafune added, "But with that many zombies on screen the sort of experiences you can have, the variety, will increase." And what about the game's heart, the personality? Inafune promises that what we saw last week was only the tip of the undead iceberg. "What you saw here today is only a very, very small fraction of what will be in the game," he said. "There are things like the story, characters, bits and pieces you don't know about that will also be in the final game as well. " Inafune wrapped up the presentation by apologizing that the game wasn't yet playable to the gathered press. "I've played it myself and I really like it," he added.